Okay, I’ll admit it right up front. I was the one guy who actually liked Transformers: Revenge of the Fallen in spite of the unforgivable racial caricaturing and schizophrenic tone. I stubbornly maintain that stance even in the face of Michael Bay’s recent “admittance” that the film was “crap.” The frigid reception of the film by critics and even fans surprisingly didn’t affect its box office prospects in the least. 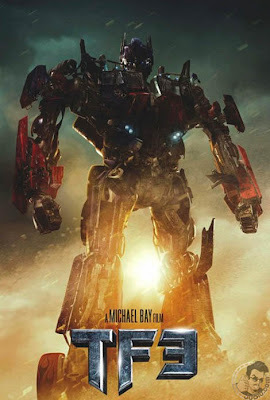 Even more surprising is that Michael Bay and company actually appear to have taken the criticisms into account while making the upcoming Transformers: Dark of the Moon. The story revolves around a downed Cybertronian spacecraft on the face of earth’s moon. The vital secrets contained therein will decide the victors of the Cybertronian wars currently taking place on earth. As expected, the survival of the human race hangs in the balance. Tyrese is ready for war. All of the principal players save for Meagan Fox have returned for another bout of robotic brawling. Rosie Huntington-Whiteley fills in for the absent Fox, playing a character that actually appeared in the original cartoon. Tyrese Gibson returns to do nothing more than yell out non-stop clichés and show off his oiled up physique. Shia Labeouf again stars as possibly cinema’s most inconsequential protagonist since Frodo Baggins. At this point, some of you may be wondering just what has changed from the last two outings. Well, from the looks of the newly released official trailer, it seems that Michael Bay has decided to actually let the audience see what the Hell is going on. Slow motion actually takes place during moments that make sense, allowing the audience to see the movements and transformations of the title characters. Action packed scenes with Prime and Bumblebee play out slowly and with the camera at a comfortable distance. Finally it seems as though Mr. Bay is realizing that people want to see what they pay for. In lieu of racial caricatures, it seems as though Bay has opted for post 9-11 paranoia as a way to inflame his audience. He can hardly be singled out for this as Spielberg and J.J. Abrams can be accused of the exact same with some of their recent offerings. Still, the scenes depicting this new faction of Decepticons laying siege to a major American city are more than a bit reminiscent of that nightmarish event. As for some memorable sites, we get an iconic image of fan favorite Shockwave, as well as an awe inspiring shot of a tentacle wielding mechanical beast shredding a skyscraper with people still inside. The plot also seems a bit more coherent and the tone more serious. It would be odd if Michael Bay actually did decide to reign himself in after the biggest hit of his career by far. Either way, I will boldly proceed to the box office on opening day and purchase a ticket. I do so with no reservations or apologies. I suspect that many of those who’ve had issues with the series thus far will be doing the same despite their incessant whining. You’d think that being “burned” twice in a row would make them wiser for the wear, but fandom has never been known for its collective ability to heed the obvious (present company included). The words “awful,” “atrocious,” and “abysmal” don’t come close to describing TRANSFORMERS: DARK OF THE MOON.